One doesn’t need a Ph.D. in football to know that the Steelers defense needed someone to step up in a big way heading into their 41-17 win over the Atlanta Falcons. Several Steelers defenders did indeed step up, and perhaps we have Tony Defeo to thank for the defender who made the biggest bang. And just like that, T.J. Watt delivered, leading the Steelers in tackles, tackling 5 players behind the line of scrimmage, hitting Matt Ryan 4 times, and sacking him 3 times, including a forced fumble which L.J. Fort recovered in the end zone for a game clinching touchdown. Articles like that remind me of the days back at the legendary Purple Goose Saloon, where I’d jaw with buddies Mike and Todd. Of course now that the blogesphere exists, it is a lot easier to fool one’s self into thinking an average fan can exert such influence. This list is just for starters. Feel free to add yours, although be judicious because Tony must wield his power wisely…. This entry was posted in Steelers 2018 Season and tagged Artie Burns, Ben Roethlisberger, Bill Cowher, James Conner, Jerome Bettis, Joe Haden, L.J. Fort, Mark Bruener, Pittsburgh Steelers, Roosevelt Nix, Sean Davis, Steelers vs. Falcons, T.J. Watt, Vance McDonald. Bookmark the permalink. 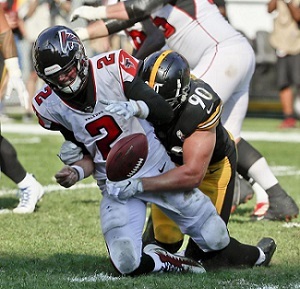 Steelers Report Card for Win over Falcons – Is Defense Finally Finding Its Way without Star Pupil Shazier?